Francis and Kaplan both the turbines come under category of reaction turbine i.e. both kinetic and pressure energy require for the power generation. In both the cases hydraulic energy of water gets converted into useful power output. Francis turbine is old turbine. The invention of Kaplan turbine is evolution in the field of hydraulic turbines or we can say that it is the upgrade version of Francis turbine. Francis turbine had some limitations which were overcome by Kaplan turbine. 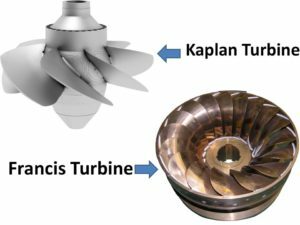 According to their construction, working and operating conditions following are the major differences in Francis turbine and Kaplan turbine. According to type of flow Francis turbine is radial flow turbine but in case of modern Francis turbine water enters radially and leaves the turbine axially which is called as mixed flow turbine. 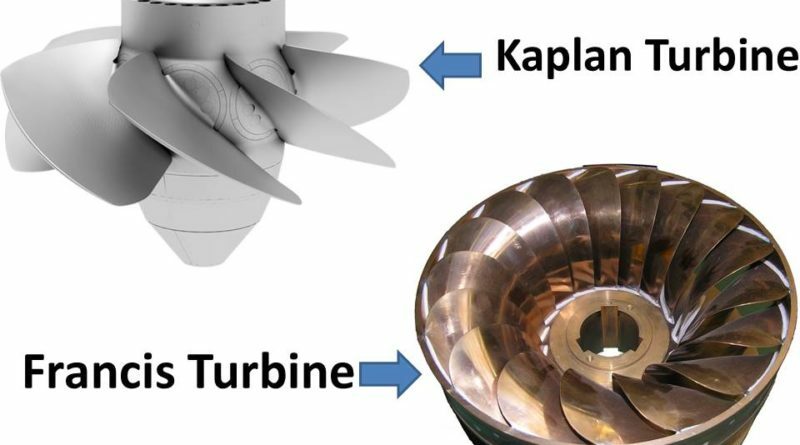 Kaplan turbine is axial flow turbine i.e. water enters and leaves the turbine runner both in axial direction. Vanes Large number of vanes in runner, generally the number of vanes are 16 to 24 Kaplan turbine is compact in size so the numbers of vanes are also less; generally the number of vanes is 4 to 8. Type of shaft The direction of shaft is may be vertical or horizontal as per requirement. The direction of shaft is always in vertical direction because it is axial flow turbine. Head available Francis turbine requires medium range of water head i.e. it generally varies from 100-600 meters Kaplan turbine works on very low head, the requirement of head is generally 100 meters. Flow rate As it is works in medium head therefore it requires medium flow rate. Kaplan turbine requires high flow rate of water. Specific speed Francis turbine works on medium range of specific speed i.e. the specific speed varies from 60 to 300. Kaplan turbine requires high value of specific speed because it is works on low head. Generally the range of specific speed varies from 600-1000. Governing mechanism Fancies turbine has simple governing mechanism. The governing mechanism of Kaplan turbine is quite complicated in construction and working. ← What is Francis Turbine? Full Notes!